Astronaut Chris Hadfield is not afraid to cry, and he isn't scared of showing you how it's done … in space. Hadfield, a veteran astronaut with the Canadian Space Agency, released a video this week explaining just how strange it is to cry in the weightless environment of the International Space Station. "Your eyes will definitely cry in space," Hadfield said during his space crying video. "But the big difference is, tears don't fall, so grab a hanky." Hadfield couldn't cry on command for his demonstration, but he did simulate tears by pouring drinking water into his eye and then blinking to make himself "cry" it out. "You can see it just forms a ball on my eye … And so if you keep crying, you just end up with a bigger and bigger ball of water in your eye, until eventually it crosses across your nose and gets into your other eye," Hadfield said. Since tears on Earth only stream down a person's face because of gravity's influence, tears shed in microgravity do not fall. Instead, they pool on the face and could eventually drift off in little droplets that disperse throughout the orbiting science laboratory. Instead of letting the drops of water fly away, however, Hadfield soaked them up with a towel, much like a person would on Earth. 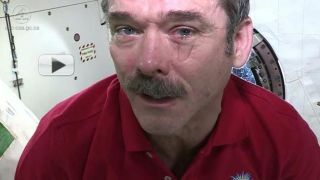 The space crying demo is only one of the latest installments in Hadfield's all encompassing series of videos about life in orbit. He has beamed down short videos about space cooking, fingernail cutting and hand washing on the space station. Chris Hadfield is one of six residents currently aboard International Space Station. He is the first Canadian commander of the station and is joined by two NASA astronauts and three Russian cosmonauts to complete the station's Expedition 35 crew. The International Space Station is the product of collaboration by five different space agencies and 15 different countries. It has been continuously staffed since 2000 and is the size of a five-bedroom house. Hadfield launched to the space station in December 2012 and is due to return to Earth in May.